I've written before about my interest in the brand, Self Portrait, and their use of lace. It is always creative, and they pick such great colors. Thankfully, with each passing season there are more and more of their pieces popping up secondhand or substantially discounted (there are quite a few on TheRealReal and I bought this one for 50% off from Neiman's last year). I wore this dress to a holiday party this weekend, paired with turquoise shoes (sadly only barely visible in the photo below) and a pop-of-color clutch, from Kohls' Reed Krakoff line, and felt festive indeed. Similar to other SP dresses I have tried, I had to go up a size from my typical dress size. It is fully lined below the waist, and above the waist, the back is unlined, but there is a bandeau in the front. Up close you can tell, but from a distance, one can look a bit more naked. I hope that they eventually expand into different shades for the lining, but so far, most of what I've seen is beige. 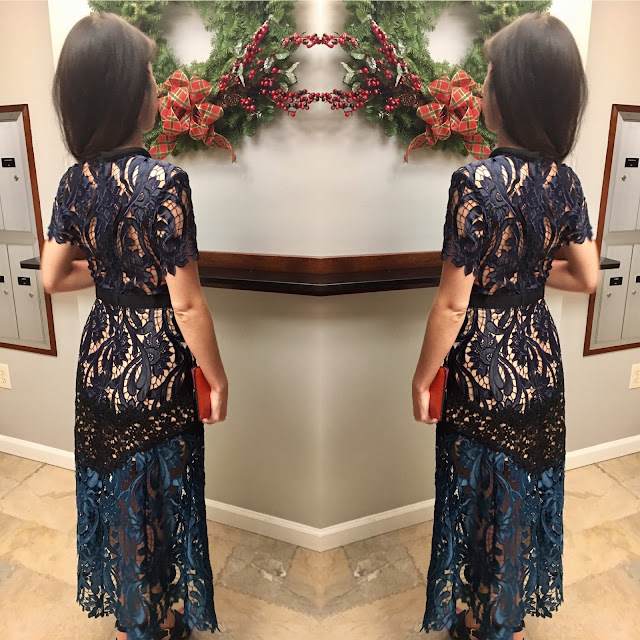 Lace, sparkle, shimmer - what do you usually gravitate toward for the holidays?